Use this tool to generate experimental designs needed to run analytic hierarchy process (AHP) analysis. Available in Excel with the XLSTAT software. The principle of AHP method is to compare the solutions of a decision problem using on a set of criteria in order to deduce the best solution. The application of such method requires defining several numerical tables whose number can quickly increase according to the characteristics of the decision problem (number of criteria, of sub criteria, of alternatives and of evaluators). In a simple case of 4 alternatives, 4 criteria and 2 evaluators, 9 tables of size 4x4 must be user-defined and provided to allow the computations of the AHP method. Each table is a square matrix with 1 on the diagonal and Saaty’s table values in the other elements of the table (go the Help menu of the AHP feature for more details). 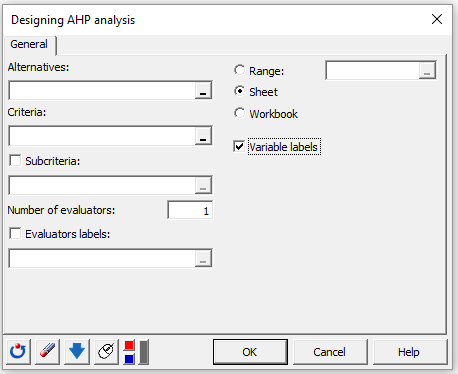 To limit typing errors XLSTAT offers the DHP tool to automatically generate tables useful in the AHP analysis. Its use is simply by specifying the characteristics of the decision problem, that is the list of alternatives, the list of criteria and sub-criteria if they exist, and the list of evaluators if necessary (see the description of the AHP method in the Help menu for the definition of terms). Alternatives: select a table that contains the list of alternatives labels. The data must be of type character. If a column header has been selected, check that the "Variable labels" option is activated. Missing data are not accepted. Criteria: select a table that contains the list of criteria labels. The data must be of type character. If a column header has been selected, check that the "Variable labels" option is activated. Missing data are not accepted. Subcriteria: activate this option if you want to select a table that contains the list of sub criteria labels. The data must be of type character. This table must have the same number of columns than the number of criteria. If a column header has been selected, check that the "Variable labels" option is activated. Missing data are not accepted. Evaluator number: enter the total number of evaluators. Evaluator Labels: activate this option if you want to select a table that contains the list of evaluator labels. The data must be of the type string. This table must have the same number of columns than the number of evaluators. If this option is not checked the evaluator label is numerical. If a column header has been selected, check that the "Variable labels" option is activated. Missing data are not accepted. Saaty Table: this table displays Saaty's values, a definition of each value, and comments. Below the table some sentences explain how to use Saaty's values. Comparison matrix of the evaluator X: this output displays on 2 or 3 lines of tables the comparison matrices that must be defined by the evaluator x. The criteria comparison matrix is displayed on the first table row. Just below, the comparison matrix of the sub-criteria is displayed if the "subcriteria" option is selected. Finally, the alternative comparison matrix is displayed if the "sub-criteria" option is checked, otherwise they are displayed on the second table row. Criteria comparison matrix: this output, in table form, displays the criteria comparison matrix. The cells on the diagonal are set to 1 and the others are empty. The cells below the diagonal are blocked. Only cells above the diagonal can be entered with values from Saaty table. Subcriteria comparison matrix: this output displays, in the form of one or more tables on the same line, the subcriteria comparison matrix if the "sub-criteria" option has been checked. The cells on the diagonal are set to 1 and the others are empty. The cells below the diagonal are blocked. Only cells above the diagonal can be entered with values from Saaty table. Alternative comparison matrix: this output displays, in the form of several successive tables on the same line, the comparison matrix of alternatives according to the criteria and the selected sub-criteria The cells on the diagonal are set to 1 and the others are empty. The cells below the diagonal are blocked. Only cells above the diagonal can be entered with values from Saaty table.